Barclays appears to have enabled much-anticipated support for Apple Pay in the United Kingdom during the early morning hours on Tuesday. A growing number of Barclays customers on Twitter have been successfully able to add their debit or credit cards from the large British bank to Apple Pay since shortly after midnight local time. Barclays was notably absent from the list of banks and participating issuers supporting Apple Pay when the mobile payments service first expanded to England, Scotland, Wales, and Northern Ireland in July 2015. 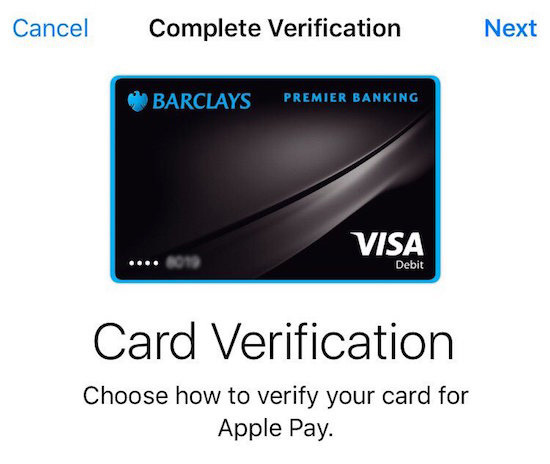 Barclays cardholders can set up Apple Pay through the Wallet app on iOS 8.1 or later. Bank-issued cards can be scanned or added manually by tapping the "Add Credit or Debit Card" option. Follow the on-screen verification steps. Apple Pay is also supported at Bank of Scotland, First Direct, Halifax, HSBC, Lloyds Bank, M&S Bank, MBNA, Nationwide, NatWest, Royal Bank of Scotland, Santander, Tesco Bank, TSB, and Ulster Bank in the United Kingdom. I refuse to use the fingerprint reader to unlock my phone. I believe Apple Pay needs this to work quickly? If it's going to ask me for my passcode instead then that's going to be too inconvenient. Apple offer a convenient way to securely verify who you are and unlock your phone. But you refuse to use it, then complain that the other method, entering a passcode, is inconvenient?! What do you want??!!! Lol!! But unlike when you use your card, when you pay using Apple Pay the retailer doesn't get your credit card details, just a one-time use code. Therefore there's no chance of your card details being exploited or leaked in any security breach the retailer might have in the future. It also means the card retailer can't use your card details to track your spending history with them, if that's important to you. Apple Pay is great... However the £30 limit in MOST (before the fanboys attack) places makes it annoying I would use it everywhere if I could. However I have been impressed with staff members knowing what it is in the UK recently. When it first was rolled out you were met with blank stares when you said you wanted to use Apple Pay they thought you were straight from Hogwarts with your magical phone. This needs reminding to people more often – Apple should make more of a deal of it in their advertising. This is WAY more secure needing your fingerprint. I hope the banks can also take notice of the improved security and get rid of the £30 limit for payments made using ApplePay. No security system is perfect. Absolutely none. But faking fingerprints is a major technical challenge that will play very little part in Apple Pay. To date, I'm not aware of any Apple Pay purchases made with a fake fingerprint. And if there are, the numbers are so low that they are insignificant in comparison to banking fraud in general. For the end consumer, you're covered against this kind of fraud, should it happen. The convenience (and security in terms of the transaction) far outweigh the risk of fraudulent fingerprints working. 1 - Suppose a thief stole your phone. He'll have to first successfully return to his house without any people/police following him. * The victim didn't already go to icloud.com and deactivate Apple Pay from his/her stolen device. * Or call his/her bank to tell them to deactivate Apple Pay from his/her stolen device. It's a much much harder process then...stealing a contactless card. I can't imagine a thief going through all this effort.